Starting with elementary facts about the largest land-sea-air battle in history may make sense because they’re so little known. Or approximation of facts, since the number of Okinawan civilians killed in 1945 will never be known, the three months of battle for their once famously peaceful, traditionally submissive island having destroyed virtually all records together with almost every building of significance. The best estimates put the death toll at slightly less than 150,000, roughly a third of the population. The 2,350 deaths at Pearl Harbor weren’t the same 33 percent of American lives but .00002 percent. Proportionately on 9/11, it would have been not 3,000 of us killed but more than 90,000,000. Giving a low priority to civilians, our infantrymen began firing indiscriminately at houses, their occupants, and anything else that moved. Of course no one can blame our exhausted, sensibly terrified combat troops, but the results were gruesome. Okinawans’ ghastly lesson from World War II was that far from protecting them from anything, foreign military bases on their island invite devastation from other foreign powers determined to destroy them. That’s why the tanks, planes, and howitzers our forces proudly park at the gates to our bases there make them shudder rather than breathe easier. 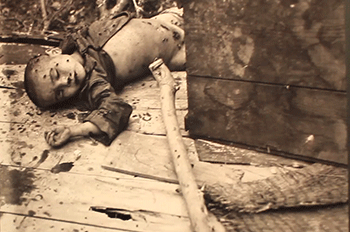 The Okinawa that was innocent, except for the compulsory service of some of its men in the Japanese army, paid a vastly greater price for World War II than did mainland Japan. Okinawa, being the poorest of Japan’s 47 prefectures and its people being the continuing subject of racial discrimination, has too little political clout to make Tokyo honor its promises. And we’re complicit in Japan’s policy and practice of injustice in the bases issue. America helped lower the quality of Okinawan life because most Japanese treated the racially mixed people a little like American whites of the time treated American blacks. The beautiful sub-tropical landscape had become, as an Okinawan survivor put it, a vast field of mud, lead, decay and maggots. The tombs of their ancestors, on which their religious life had centered, were among the ninety percent of structures that had been blasted to rubble and dust. The battle of Okinawa never ended in the sense that American forces remain on the site much against the majority’s will. Mile after mile of our bases, almost all of them on the flat, tillable land that has always been scarce on the mountainous island, disfigure territory and lives alike. Ugly barbed-wire fences are evidence that we’re behaving there in direct violation of our belief in truth, justice, and decency. Our actions there, which have a disturbing resemblance to George III’s treatment of the American colonies, are hard to defend without ignoring all considerations except narrowly military ones, and not even all of those. A visit to the island and tour of some of our 38 land-hogging facilities may well pose the question of whether our military establishment and thinking are making us the people we want to be. Even if you don’t get to know extremely courteous Okinawans long enough for them to open up about their wish to be free, it may well also prompt shame. Of course they have their share of lotus eaters and money-grubbers who want more of the money bases earn in ground rent, now paid almost entirely by Tokyo, and the takings of bars and cafés. But I won’t apologize for repeating that the majority wants nothing more than to be left in peace. Read the full article on the Collier’s site. This entry was posted in History, International, Op-ed, Politics. Bookmark the permalink.